OLYMPIA – For the past 20 years, service dogs have helped Sheryl Womble with day-to-day tasks like opening doors and picking things up off the floor, and even taking off her coat and gloves. So when a dog wearing a “service animal” vest growled and lunged at her dog during a crowded community gathering several years ago, she knew the menacing dog was not a trained service animal. Womble, a quadriplegic, did the only thing she could. 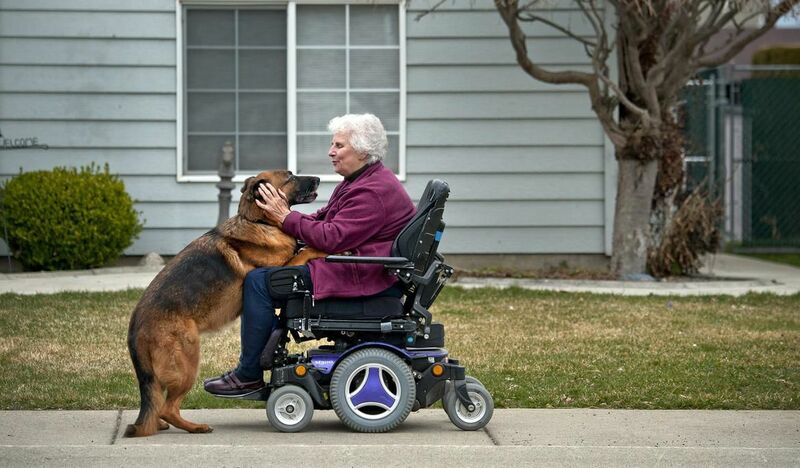 She maneuvered her wheelchair to block the attacking dog. She got bit. Womble trains service dogs and knows a vest, a badge, even a certificate that says a dog is a service animal doesn’t mean anything. “You can buy those on the internet,” she said. To be a real service dog takes extensive training, at least a year and sometimes longer depending on what the dog will be doing to help its owner. A new Washington law that allows businesses to question whether the animal accompanying a customer is a true service animal may provide some clarity and keep some people from trying to pass off their untrained pet, Womble and others said. “It might help a little,” said Debbie Wing of LynnDee’s Grooming and Dog Training Center. “It might scare some people off” from trying to pass off their pet as a service animal just because they want to bring it into a store or restaurant, or take it with them on a bus or plane. The law uses the federal Americans with Disabilities Act definition of a service animal, which covers only dogs and miniature horses, so other animals are automatically excluded. The animal must be trained to perform a specific task for a person with a physical, sensory, psychiatric or mental disability. But the ADA does not set up a certification program for service animals, Wing said, so it’s easy for a person to make that claim and hard for a business to challenge it. 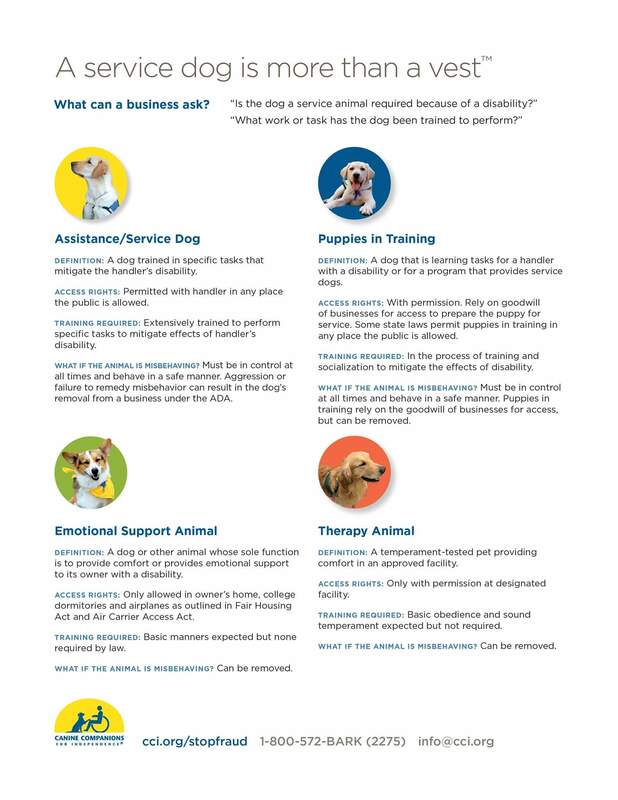 Under the new law, a business employee or law enforcement officer can ask the owner two questions if they suspect a dog that is causing a disturbance isn’t a true service animal: Is the animal required because of a disability? What tasks is the animal trained to perform? Deputy Mark Gregory, a spokesman for the Spokane County Sheriff’s Office, said the new law could provide some clarity for officers responding to complaints that come in from time to time. Whether it will result in more calls, or fewer, is hard to predict, but the department will sit down with legal advisers and human rights advocates to form a policy before briefing deputies on procedures, he said. Usually, law enforcement is called when a dog or another animal is creating a nuisance or disturbance in a store or a restaurant and the owner refuses to leave, claiming it’s a service animal. The fact it’s creating a disturbance is almost a dead giveaway that it’s not a service animal, which is trained to ignore other animals and people, Wing said. If it’s on an extendable leash, or not on a leash at all, that’s another sign. Service animals are trained to be on a leash and 12 to 18 inches from their owner. But the size or breed of a dog is not an indicator, she added. A 6-foot man who is diabetic could have a Chihuahua for a service animal, trained to detect by smell when he needs to take his insulin. Also not an indicator: a vest on the dog or a badge the owner is wearing that says service animal. Those are available online, for a price, by filling out a form. “It’s a racket,” Wing said. Buying a trained dog can cost thousands of dollars and require years on a waiting list, she said. Training a service animal also takes time and money. Womble said owners start with basic obedience, and work toward specific tasks they need the dog to perform. They keep a log of training and tasks accomplished, and the instructors used. They refresh their training every year or so. “You never stop working your dog,” she said. Most people quit, because they either don’t have the time or money, or both. And really all they want is to take their pet with them somewhere, she said. The law does not cover therapy dogs, which have separate training to go into schools, hospitals or other facilities to help people. Nor does it cover comfort or emotional support animals, terms that some people use for a wide variety of pets they might claim they need to calm their nerves. Gregory wonders if that might be something the Legislature will have to consider in the future, because some returning veterans and others with post-traumatic stress disorder do have a legitimate need for a therapy animal to help them cope with severe anxiety they might experience in aspects of daily life. PTSD isn’t covered under the ADA, so they aren’t included in the state law, he said. An officer who believes an owner is falsely claiming their disruptive dog is a service animal will be able to write a ticket for a civil infraction. The owner can contest the ticket and possible fine of $500 in court by presenting proof that the dog is a service animal. Judges familiar with the ADA should know not to accept a simple certificate from some website, Womble said. They should ask to see the owner’s log with the times, dates and places where the training took place, and the instructors who provided it. If the law cuts down on incidents with untrained dogs, there may be an added benefit to real service animals and their owners, who sometimes get critical looks or comments from people, Wing said. Rep. Mike Steele, R-Chelan, the sponsor of the legislation, said the goal of the law is to balance the rights of disabled people to have the assistance they need with the rights of the rest of the public to be safe from misbehaving and possibly aggressive dogs. It’s designed to give businesses and police some options when there’s a problem. Depending on where you live, many businesses are now increasingly pet-friendly such as clothing stores, hotels, pet supply stores, photography studios, etc. For people who use and need service dogs for medical purposes or assistance, this can be a blessing and sometimes a problem. Compounding the problem is the definition of what is considered to be a service animal. Under the ADA, service dogs allow people with medical conditions or disabilities to function and participate in society such as going to movie theatres, the grocery store, work, restaurants, etc. A service dog may pull a wheelchair. Another example is that a service dog can help a person with epilepsy by detecting and then keeping the person safe during a seizure. Of course, many of us frequently see guide dogs for people with visual impairments. Businesses and other entities do have rights that protect them if a particular service animal behaves in a way that poses a direct threat to the health or safety of others or is not under the control of the handler. Staff are not allowed to request any documentation for the dog’s training, require that the dog demonstrate his/her task, or inquire about the nature of the person’s disability. Some states have regulations to protect people with disabilities that do not infringe on their civil rights. Colorado passed a law last year that imposes fines on people who misrepresent ordinary dogs as those specifically trained for the purpose of assisting someone with disabilities. California takes the law further. Service dogs must be registered with the California Department of Food and Agriculture, which provides standardized identification tags. Anyone in California who falsely claims an animal to be a service animal can be charged with a misdemeanor, punishable by imprisonment in a county jail for six months or a fine up to $1000 or both. Depending on the title within the ADA law, ADA is overseen by the Department of Justice (DOJ) or the Equal Employment Opportunity Commission. So, FHA is more all-encompassing to ensure fair housing for everyone. It covers people with disabilities who need a service dog to perform tasks and people who need animals (any type) for emotional support. It overrides “no pets policies” by landlords. FHA provisions are also built in in case the animal may be considered a danger to others or property. Property owners – if the disability is not apparent – can ask for documentation from a physician, psychiatrist, social worker, or other mental health professional that the animal provides emotional support that alleviates one or more of the identified symptoms or effects of an existing disability. The law does protect civil rights because landlords cannot ask for medical records or the nature of the disability. Providing safety checks for, or calming, individuals with Post Traumatic Stress Disorder. Sensing an anxiety attack and taking a specific action to help avoid the attack or lessen its impact. Reminding a person with mental illness to take medications. It is certainly sad that psychiatric disorders are considered “murky” or go unrecognized in this day and age. The Air Carrier Access Act (ACAA) was enacted to protect the civil rights and health of people with disabilities who use service animals, people with Emotional Support Animals (ESAs), and people with PSDs to be able to bring the animal into the cabin. This law falls under the aegis of the Department of Transportation. Request the credible verbal assurances of a qualified individual with a disability using the animal. Look for physical indicators such as the presence of a harness or tags. Observe the behavior of the animal. For ESA and PSD, airlines can request specific documentation and/or 48-hours advance notice that cannot be older than one year. It must state a mental or emotional disability that is recognized in the Diagnostic and Statistical Manual of Mental Disorders, and a need for an ESA or PSD for air travel or at a destination. It must be written by a licensed mental health professional who provides care to the person, dated, with type of professional, and jurisdiction or state in which the license was issued. Airlines are never required to accept snakes, reptiles, ferrets, rodents, and spiders. Additionally, they can refuse an animal if it is not properly behaved. However, an animal cannot be refused if it just makes the crew or other passengers uncomfortable. Some people sadly take advantage of the ADA, FHA and ACAA. The ADA does not require that service animals be certified or licensed. Certification could be considered a barrier to entry and therefore discriminatory. 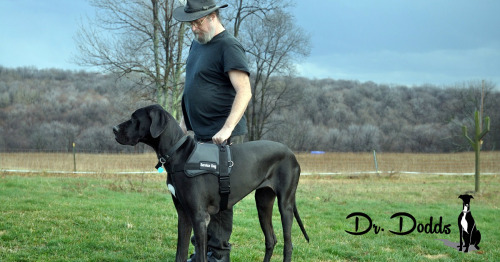 A service dog does not have to be professionally trained, but can be personally trained. A professional training requirement may be considered a barrier to entry. Some state and local laws define service animal more broadly than the ADA. We have to remember that “trained for a specific task” is not the same as well-behaved – and this is where the ADA standards can fall apart. As noted above, businesses have certain rights. However, businesses are reluctant to deny access to misbehaving service animals or ask if the animal is a service dog because they may pose their questions poorly. Then, they could be prosecuted for violating civil rights. People with disabilities who use well-behaved and trained service dogs are becoming rightfully angry and upset when people are taking advantage of the law. In addition to the life-saving, emotional and functioning assistance service dogs provide, we need to remember the cost and number of years it took to get the dog to be specially trained. For instance, the full cost to breed, raise and train a service dog to help a child within the autism spectrum can be over $20,000. A guide dog for a person with a visual impairment is around $50,000. Today, people with well-behaved and trained service dogs are pointing to people with ESAs or PSDs for making life more difficult for them outside of the home and on public transport and planes. In fact, the Advocates’ Service Animal Proposal wants to limit the rights of people with ESAs on planes. But, it is not a problem created by responsible people with legitimate ESAs or PSDs. It is only people who take advantage of the laws, as they are harming the civil rights and protections others desperately need. “Advocates’ Service Animal Proposal.” (n.d.): n. pag. United States Department of Transportation, 21 July 2016. Web. 18 June 2017. https://www.transportation.gov/sites/dot.gov/files/docs/P4.SA%20Advocates%20Proposal%20072116.pdf. “Air Travel with Service Animals.” (n.d.): 189-92. United States Department of Transportation. Web. 18 June 2017. https://www.transportation.gov/sites/dot.gov/files/docs/AirTravel_with_ServiceAnimals-TriFold.pdf. “Frequently Asked Questions about Service Animals and the ADA.” United States Department of Justice, 20 Jan. 2015. Web. 18 June 2017. https://www.ada.gov/regs2010/service_animal_qa.html. “Service Animals and Assistance Animals for People with Disabilities in Housing and HUD-Funded Programs.” (n.d.): n. pag. United States Department of Housing and Urban Development, 25 Apr. 2013. Web. 18 June 2017. https://portal.hud.gov/hudportal/documents/huddoc?id=servanimals_ntcfheo2013-01.pdf. “Service Animals and Emotional Support Animals.” ADA National Network, 27 June 2017. Web. 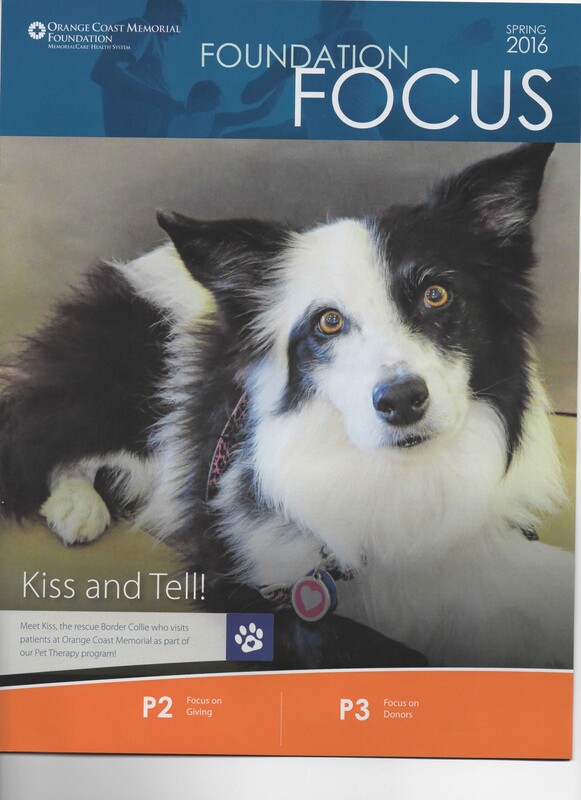 18 June 2017. https://adata.org/publication/service-animals-booklet. “States Specifically excluding PSDs from State Definition of Service Dog.” Service Dog Central, n.d. Web. 18 June 2017. https://www.servicedogcentral.org/content/node/464. Dogs don’t so much see the world as they do smell it. Our canine companions can detect the tiniest odor concentrations—around one part per trillion. For us, that would be like detecting a teaspoon of sugar in two Olympic sized swimming pools. This allows them to work as medical detection dogs, where they sniff out various forms of cancer and diabetes. In the case of diabetes, specially trained dogs can tell when their owner’s blood sugar level is low—a sign of a possible hypoglycemia attack. For people with type 1 diabetes, low blood sugar can cause problems like shakiness, disorientation, and fatigue. Failure to receive a sugar boost can lead to a seizure and even unconsciousness. For some, these episodes occur suddenly and with little warning. When a diabetes detection dog senses that their owner is in trouble, they notify them by performing a predetermined task, such as barking, laying down, or putting their paw on their shoulder. But how do these dogs know? What is it, exactly, that they’re sensing or smelling? This question has mystified scientists for years, but a new study by researchers from the Wellcome Trust-MRC Institute of Metabolic Science and the University of Cambridge has finally provided the answer. It’s isoprene. That’s what these dogs are smelling—a common natural chemical found in human breath. The scientists recruited eight women with type 1 diabetes, and under controlled conditions, lowered their blood sugar levels. Using mass spectrometry, they looked for specific chemical signatures to detect the presence of certain molecules. Looking at the data, the researchers found that isoprene rose significantly during hypoglycemia (the medical term for critically low blood sugar levels). In some cases, the presence of isoprene nearly doubled. Humans are oblivious to isoprene, but the researchers figure that dogs are particularly sensitive to the chemical, and can easily tell when their owner’s breath contains too much of it. As to why the body produces more isoprene during hypoglycemia, the researchers think it’s a byproduct of cholesterol production. Still, they’re not entirely sure why this chemical rises when blood sugar gets low. Using this knowledge, the researchers would like to develop a medical sensor that does the same thing as diabetes sniffing dogs. What’s more, a handy breath device could replace the current finger prick test, which is inconvenient, painful, and relatively expensive. It’s important that we don’t overstate some of the purported abilities of medical detection dogs. They seem to be pretty good at detecting certain cancers (e.g. urological cancers and breast cancer) and diabetes, but many of these accounts are anecdotal, and much of the research tied to these canine abilities is still in early stages. Claims that dogs can sniff out lung cancer, colorectal cancer, and even Parkinson’s Disease are still under investigation and are far from proven. Still, it’s an exciting line of medical research that, like this recent study, could lead to new scientific insights and powerful new medical technologies. Jane Horsfield and her wonderful border collie, Kiss, were named Volunteer of the Year at Orange Coast Medical Center! Congratulations Jane and Kiss! 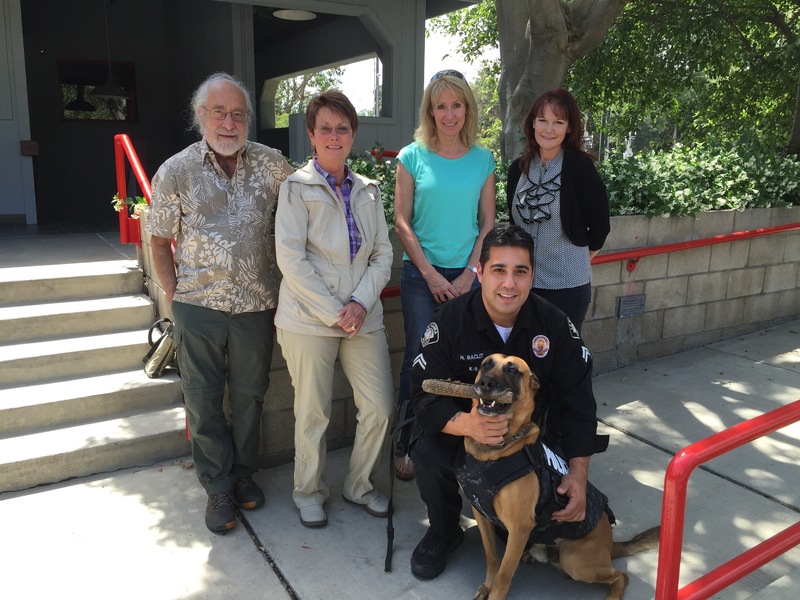 AHF Donates Vest for La Habra’s Police Dog, Prinz. 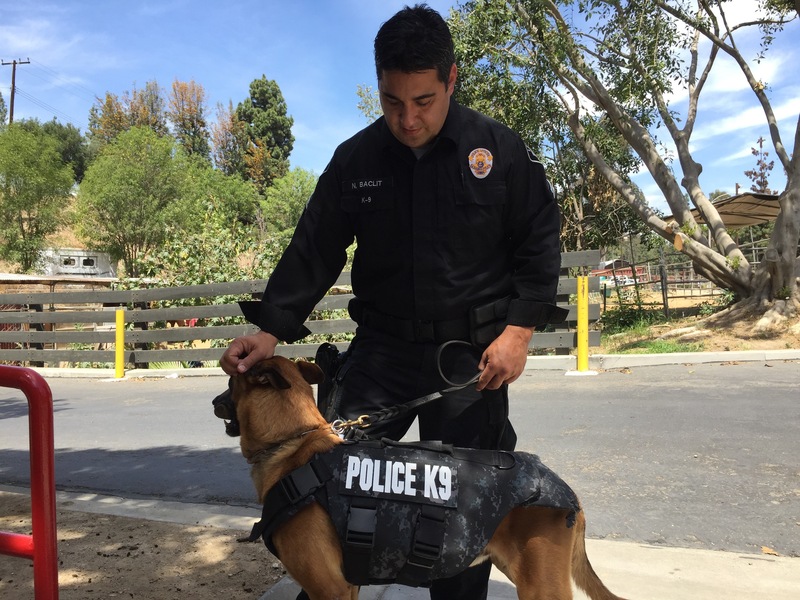 Prinz, one of La Habra’s two police dogs, will soon be much safer while on duty, thanks to a new ballistic vest that will protect him from potential stabbings or bullet wounds. 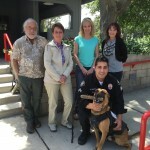 The vest, valued at $950, was awarded to Prinz by the Massachusetts-based nonprofit Vested Interest in K9s Inc. and the Animal Health Foundation, a charitable organization located in Lake Forest. 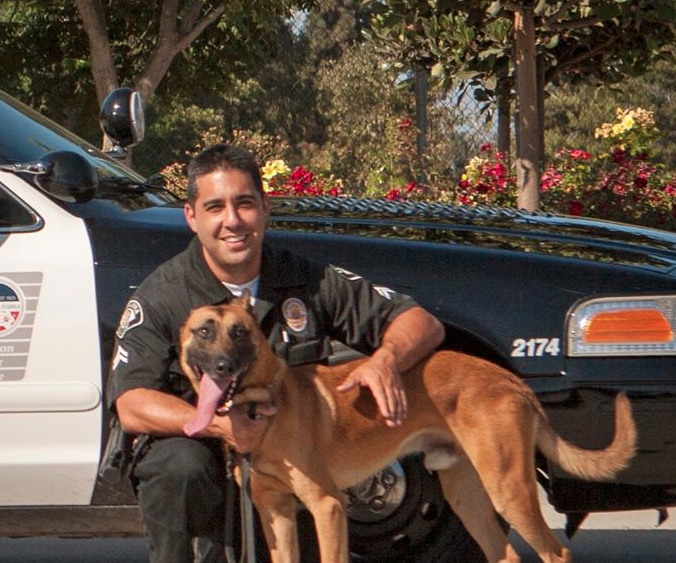 Prinz is part of two K-9 teams at the La Habra Police Department. Each team is comprised of an officer and a police dog assigned to the patrol division where they are deployed to conduct area, perimeter, and building searches. These highly trained dogs assist the officers in performing their duties in a safe manner, by alerting on the areas where suspects have concealed themselves in an attempt to evade capture. Recently, there have been several high-profile cases where police dogs have been shot in the line of duty. 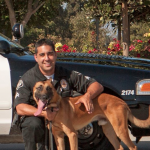 The most famous is the Anaheim K-9, Bruno, who was shot and injured last March. 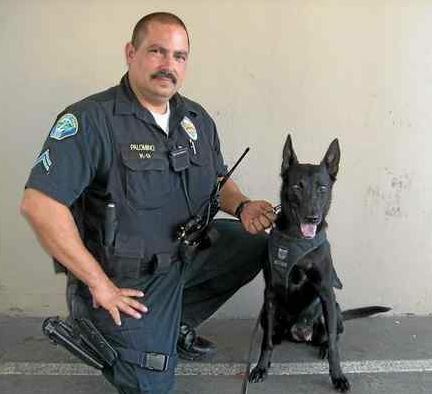 And on Sunday, Reiko, a police dog with the West Covina police force, was shot and injured during a standoff with a gunman. Bruno has since fully recovered and Reiko is expected to do the same. 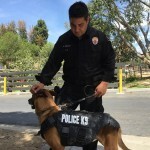 The nonprofit Vested Interest in K9s was established in 2009 to assist law enforcement agencies with providing this potentially life-saving body armor for their four-legged officers. Through private and corporate sponsorships, Vested Interest in K9s, Inc. has, since 2009, provided more than 1,125 law enforcement dogs in 40 states with protective vests at a cost of more than $1 million. The Animal Health Foundation is committed to improving the health and welfare of animals by supporting and promoting charitable, scientific, literary and educational activities. DIANE PAPAZIAN was allergic to dogs and she didn’t especially want a second one, but her husband, Harry, persuaded her to let him purchase Troy, a 3-month-old Doberman pinscher. Not long afterward, Troy was in bed with the couple one evening and began insistently nuzzling Diane’s left side. It caused her to start itching, and that’s when she discovered the lump in her breast. It turned out to be malignant, but Diane is now cancer-free after a double mastectomy and chemotherapy. The Papazians credit Troy with saving Diane’s life. And he’s not the only pet who has helped owners make such a discovery. A number of dogs and cats have alerted their people not only to various cancers and dangerous infections, but also to oncoming seizures, allergic reactions and hypoglycemia (low blood sugar). Our dogs and cats may not have been to medical school, but their superior senses of smell, as well as their habit of closely observing us 24/7, put them in the catbird seat when it comes to recognizing that something in our bodies has changed, even if we’re not always sure what they’re trying to tell us. Scientific studies have confirmed the canine ability to sniff out lung, breast, bladder, prostate, colorectal and ovarian cancer, in some cases before it’s obvious through testing. They do this by taking a whiff of urine or breath samples from patients. Dogs have also been trained to alert people to oncoming epileptic seizures and assist them to a safe place until the seizure is over. What’s their secret? Dogs and cats live in a world of smells, and their olfactory sense is far more acute than our own. Physiological changes such as lowered blood sugar or the presence of cancer produce or change volatile organic compounds (VOCs) emitted through the pores of the skin. Animals smell the difference and respond to it by licking, poking or pawing at the area.